I only bring out the DIY romper once a year on very hot days. 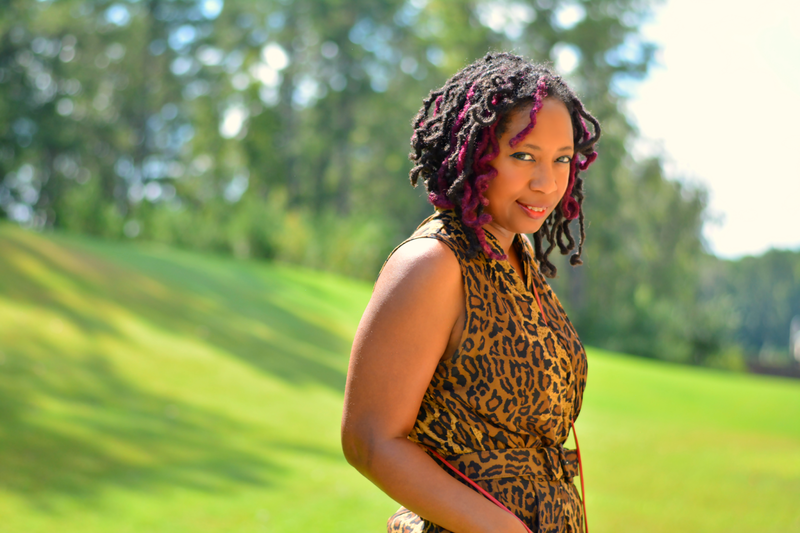 Last year, I let the leopard print be the show. This year, I added red and blue. This romper is one of my favorite Goodwill finds. It was love at first sight when I found it on my birthday. I used my birthday coupon too which makes finding it even sweeter. There were sun spots on the leg so I cut them off and ended up with this really short yet fabulous romper. It only seems to make it out once a year because of the length and it's a romper with a belt. It's not very practical. There's a lot of adjustments that need to happen. If I go to the bathroom there's no guarantee it will all come back together correctly. I haven't tossed it aside though. The find was just so perfect. 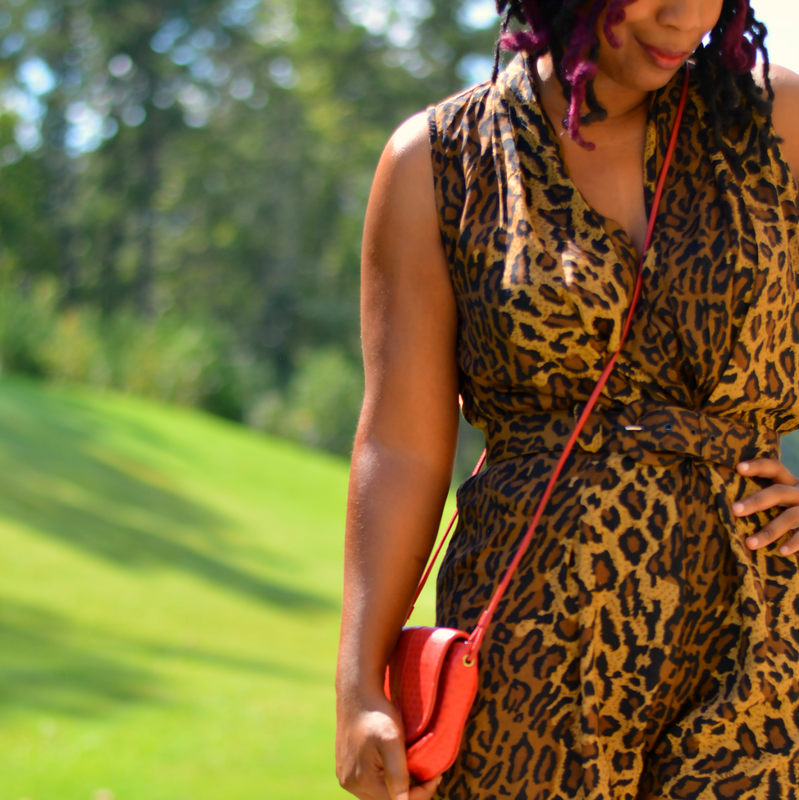 The jumpsuit is vintage 90s but it has a very classic shape. I always receive compliments when I wear it. Maybe it's the overwhelming awesomesness of the animal print. Since I went subtle last time, I went a bit bolder this time with a red purse and blue shoes. I've been wanting a mini bag so I was happy to have found a vintage one in such a vibrant shade of red. I thrifted it awhile ago and rediscovered it in the unpacking. The blue sandals did not receive a lot of love this summer due to one shoe going missing shortly after purchase. Found it under the bed when I was packing up. I'm finding gems everywhere thanks to this move! 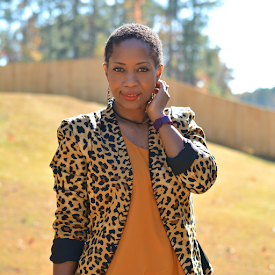 What do you wear with leopard print? That romper is the cutest thing ever! Love it! 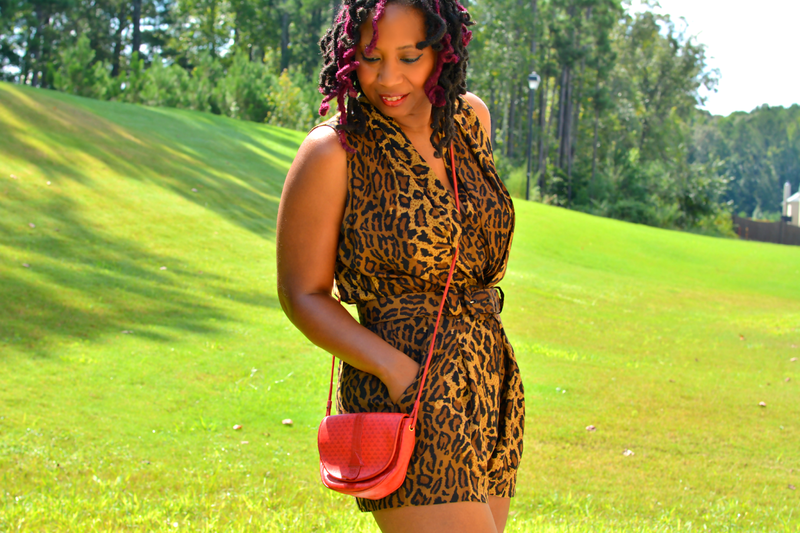 I always love a good romper, and I always love leopard print...so of course this is perfect! Hey Sassy!! how are you all?? How is ATL treating you?? You look fab in this romper. Looking great :) Love how you chose to style this with shoes and bag not matching colors. I love that bright pop of blue!!!! What a fun little romper! Love the sandals too!